Long before Ins Choi‘s Kim’s Convenience became a television sitcom, it started life as a stage play. 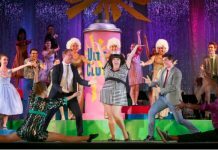 After watching it play out on the Pacific Theatre stage it is easy to be reminded how, with just a few tweaks, this comedy was destined for the small screen. Don’t take that the wrong way though. 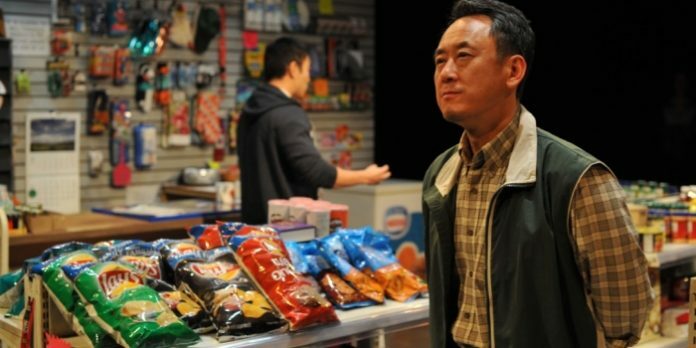 For although Kim’s Convenience has blossomed into a hit situation comedy on CBC (and Netflix), the stage play is filled a humour and heart that is all but impossible to capture in just 22-minutes each week. And for those who have made Kim’s Convenience part of their weekly television viewing, it also provides some necessary context and a surprisingly dark underbelly. Set in a fictional corner grocery store in Toronto, Kim’s Convenience is the story of the Korean-Canadian Kim family, headed by stubborn Mr Kim who has built his tiny empire from nothing. As his Toronto neighbourhood begins to transform, he hopes his daughter Janet will take over the store when he retires. She has other plans for her future though. That leaves Mr. Kim’s younger son Jung to carry on his legacy, but there is a huge rift between father and son that first needs to be closed. Director Kaitlin Williams sets us up for an intimate take on this family comedy even before we take our seats in the tiny Pacific Theatre space. Walking through Carolyn Rapanos’ realistic convenience store set is such a pleasure. From the peg candy to the lottery tickets at the cash register, there is an immediate familiarity for anyone growing up with a corner store in their neighbourhood. It is tough not to spend more time exploring its tiny aisles, but its biggest impact comes from welcoming us so intimately into this family’s world. But while Rapanos may have captured the setting, it is this cast who so brilliantly capture the necessary undercurrents of its inhabitants. Leading the way is James Yi who finds the necessary balance between the façade of the irascible store owner and stoic Korean father, to the touching challenges of the family dynamic. Constantly on the verge of offending pretty much every minority who walks through his store, Yi manages to make these uncomfortable utterances both funny and charming. Beneath his gruff exterior though, Yi also gives Kim’s Convenience much of its heart with flashes of a deep familial bond that has been marred with violence, of both the physical and emotional kind. As wayward son Jung, Lee Shorten brings one of the play’s most emotionally charged scenes to vivid life. Yi’s performance is effortlessly matched by the remainder of this cast. As Janet, Jessie Liang finds a realistic balance between family and future, and as Mrs. Kim, Maki Yi carries her character’s baggage with a quietly introspective grace. 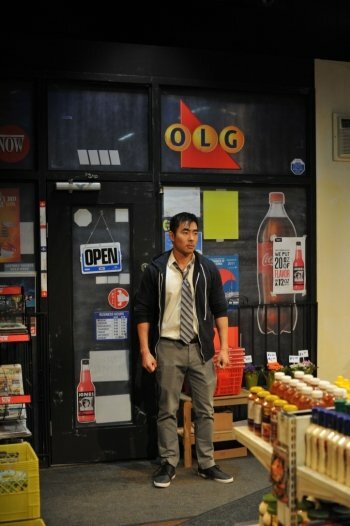 As wayward son Jung, Lee Shorten brings one of the play’s most emotionally charged scenes to vivid life. And finally, Tré Cotton gets to have a great deal of fun playing a half-dozen or so characters who visit the store. The risk in bringing back a show like Kim’s Convenience, especially now given its prominence on television, is that audiences may hesitate in returning for a visit. Fortunately this production brings something new that was missing the last time it was seen in Vancouver, and most definitely absent on television. It isn’t afraid to go a little darker between the laughs. Just like a real family. Kim’s Convenience by Ins Choi. Directed by Kaitlin Williams. A Pacific Theatre production. On stage at Pacific Theatre (1440 W 12th Ave, Vancouver) until October 6. Visit pacifictheatre.org for tickets and information.